Jose Mourinho has dubbed Liverpool "the lucky ones" as his Manchester United side prepare to head to Anfield on Sunday. 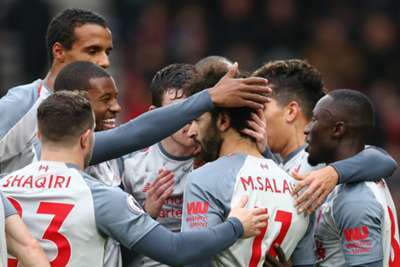 Jurgen Klopp's men are looking for a victory to return to the top of the table following Manchester City's 3-1 win over Everton on Saturday, and they are the only remaining unbeaten side in the Premier League. United are 16 points further adrift of Liverpool in sixth, although Mourinho suggested Klopp's side have enjoyed the rub of the green of late. Divock Origi's Merseyside derby winner deep into stoppage time came following a bizarre error from Everton goalkeeper Jordan Pickford, while the first goal of Mohamed Salah's treble at Bournemouth last weekend should have been disallowed for offside. "Liverpool are very confident about themselves," Mourinho told reporters. "They are top of the league, they have this feeling of - and I know that feeling well - the feeling of 'the lucky ones', where everything goes in your direction. "They know how they beat Everton, they know that in the last match at Bournemouth the opening goal was offside, and they know that against Napoli in the last seconds they could be out [of the Champions League]. "They have this feeling that I also had when my teams were top of the league and it looks like everything goes in your direction." United ended a run of four Premier League games without a win by thrashing Fulham 4-1 last weekend, only to have momentum halted by a 2-1 Champions League loss at Valencia. Nevertheless, Mourinho does not believe Klopp will be underestimating the challenge that awaits, with the former Borussia Dortmund boss yet to taste Premier League victory in the fixture. “I think Liverpool are obviously very, very confident but I think they are not stupid. They also know the match they have with us is difficult," he added. "They also know that we have our weaknesses, our strengths, and I think they will respect our strengths. "I think if they don’t do that I will be happy with that. But I think they know that the game is very difficult for them. "They know that they need every point if they want to be champions so I think they are professionals and being professionals is respecting Manchester United. They know that we can go there and win."